An old favorite meets a new one with Fortnite Monopoly! It is now available to preorder on Zavvi for $34.99. 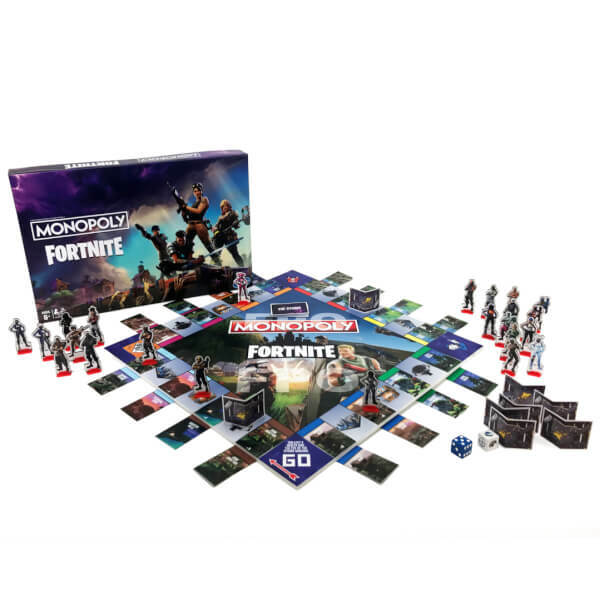 While many alternate Monopoly boards are simply themed reskins, Fortnite Monopoly attempts replicate the battle royale element. While owning property still plays a role, players will also have lives. This is a deviation from the battle royale formula’s a one life to live situation. I guess everyone wants to put their own spin on battle royale. On any given turn, players can use their dice roll to move along the board or perform an action such as healing with bandages or even shooting another player (if they’re in their line of sight). The Fortnite version of Monopoly even has its own storm. Once a space is “taken by the storm,” landing on it will cost you two lives. Overall, it seems like an interesting concept. Objective of the game: Be the last player standing. Properties are locations on the Fortnite Island. First come, First served! Take the property card for yourself. Dice: On your turn roll both dice (movement and action) then decide which to resolve first. The Storm: Spaces taken by the storm can still be landed on but they come at a terrible price. When you land on a property that has been taken by the storm you lose 2 life. The previous effects of that space are also ignored. Would you play Fortnite Monopoly? Let us know in the comments below.